I had a new to Nia person come to class today. She called me yesterday to ask about it and showed up to class today. I like that. Of course, I asked her about it after class. She said she liked it because it made her think. She said that is what she needed. Nia is amazing because it is one of those exercises that DOES make you think. There are differences in a Nia routine. There are times when there is Free Dance, a time where you don’t think. You just let your body move to the music. You let it go and see where it takes you. It is not a trance dance, you are not in a state of trance, but you are letting your body move to the music without thinking. There is no thinking of what others think or how you look, or of a pattern, you just move. There is also the choreographed steps. Some of those steps are described as the actual dance steps there are, say a Jazz Square, a grapevine, a ball change, etc. And when learning them or even when incorporating them into a routine there may be thinking involved. There is also the imagery used in Nia. Where instead of saying reach up we might say pick an apple, instead of just saying walk we might say walk Jazzy, instead of saying get down on the ground we might say melt onto the earth . . . .these things might cause you to have to think for a moment. What are the movements involved in picking an apple? What does “Jazzy” mean? How does a body melt? Sometimes a routine will have us doing a movement that is out of the ordinary. Say against the normal “flow” of movement. And again that is where we have to think. So sometimes, yes, we do think in Nia. Right now I have just begun teaching a routine, I have only taught it once and it is making me laugh because when I first saw Debbie Rosas do it on the DVD I didn’t understand why she said left hand on one section and right hand on another. To me it looked as if she was alternating. So the first few times I did it, I alternated my hands that I started with. When I was barring the song and I went to write down the arm choreography I stopped to watch it closely. She says left when we start with the left ONLY and right when we ONLY start with the right. There is alternating hands in between, but not alternating starting hands. This is one of those funny moves that makes me think. I love that the other teachers on the DVD didn’t quite get it either. Makes me feel better. Makes me remember that it is a practice and my brain and body will have to think about this move until I have it engrained. 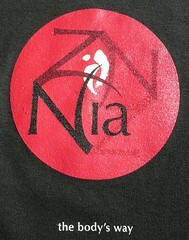 I love that Nia is Body, MIND, Emotions, and Spirit (BMES). I love that new people come in and see all that it is and say they love it. I love it even more when they come back. I always say that there was a reason Nia was once named Neuromuscular Integrative Action . . . . because that is really what it IS. I don’t know why they abandoned that, but I can imagine. It is a mouthful. And to some perhaps it sounded intimidating. Once people come to class they get to see it for themselves. It really was/is an ingenious name, just a bit much, I guess. As we are thinking we are using our nerves and our muscles. I took dance lessons when I was young. I cannot remember a time when I didn’t know the Jazz Square. Of course there had to be a time because one is not born knowing what a Jazz Square is much less how to do one. But I don’t remember not knowing how to do it. So I actually must have learned it prior to my dance lessons, because I was young when I took my lessons but not THAT young. Whatever the case . . . . unfortunately it was all too long ago for me to truly know . . . I knew what a Jazz Square was when I entered my first Nia Class and when I took the Nia White Belt Intensive. 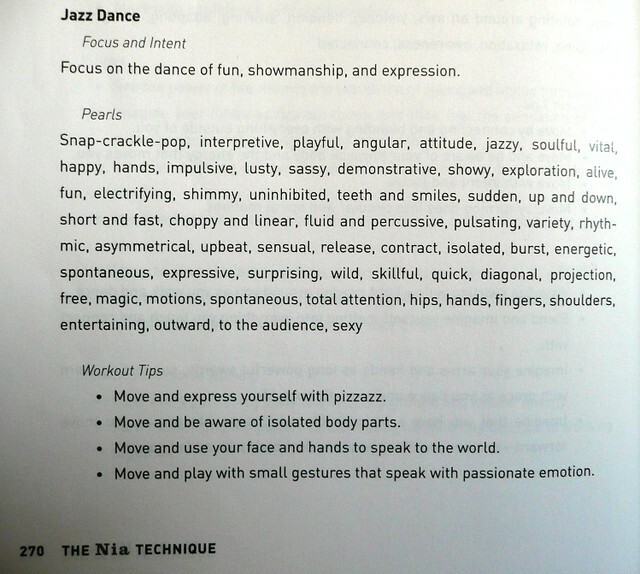 While the Jazz Square is not included as one of Nia’s 52 Moves it is something we do a lot in our routines. It could be considered part of the Jazz Dance that is one of the Nine Movement forms that make up Nia. Well, not everyone has had dance lessons or knows how to do a Jazz Square. So we can use the clock to help them. Nia has a core set of moves called Nia’s 52 Moves. Three of them actually have “clock” in their names. One is Rock Around the Clock, another is Slow Clock, and another is Fast Clock. So it makes sense that with those moves we would use a clock image to do the move and/or help explain and instruct the move. I have posted before about how we use the clock to help direct other moves. Well, the Jazz Square is one of them. While it is called a square it sometimes might be more of a rectangle, but the idea is to use the four corners. First thing to know is that the Jazz Square is just four steps. So often I will just have my students march or step four counts. Sometimes we will get the dance going with that and then move to the square. Some people stay with the marching and that is fine. Another VERY important thing to know AND DO is to weight each step. As in, put all your weight onto each step you take. When you are learning the jazz square this is of the utmost importance. This will ensure that you are taking a left, right, left, right (or right, left, right, left) approach and not trying to use the same foot – as in left, left, right, left – and just getting tangled up. Let’s do a Jazz Square left-over-right. So we will be starting with our left foot and having it cross over the right foot to the right side. The left foot comes over to the right and lands on 2 o’clock, the right foot comes back to the back right corner and lands on 4 o’clock. Then the left foot steps back to the back left corner – 8 o’clock, then the right foot steps over to the upper left corner – 10 o’clock. That is one jazz square. To keep going the left foot swings around the right foot to the upper right corner – 2 o’clock and you continue on. 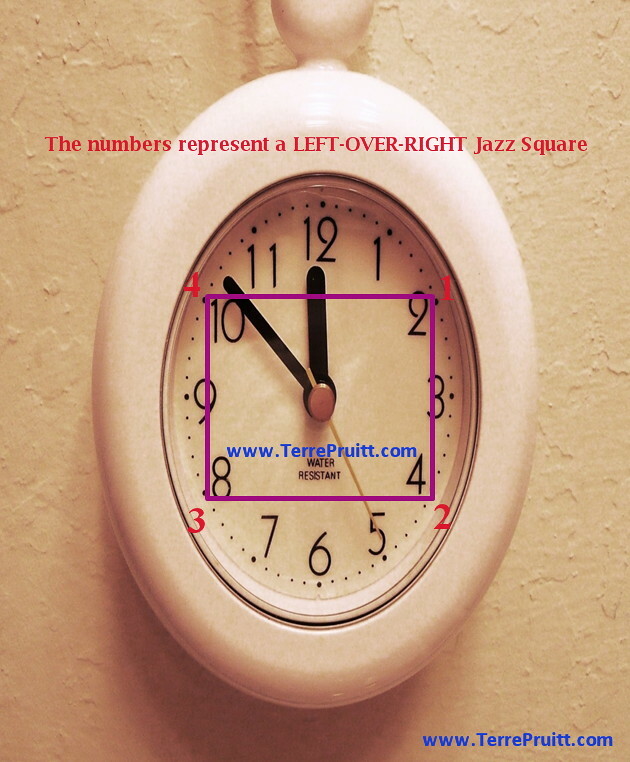 So right-over-left is: right foot to upper left corner (10 o’clock), left foot to back left corner (8 o’clock), right foot to back right corner (4 o’clock), left foot to upper right corner (2 o’clock). To keep going the right foot must swing around the left foot back up to the upper left corner (10 o’clock). Sometimes when we are doing a fast jazz square my square turns into a diamond with step one being more at 1 and the corners a little askew. But I have corners! As with many things sometimes it is easier for a person to do it one way than the other. So it might be easy to do left foot over right foot, but when you switch it is not as easy. Sometimes that is when a student will march. Or they will do the jazz square but not the hand or body movement that we pair with it. Continuing to move is the key so whatever they do is great. Eventually with practice, the can do it! Do you do the Jazz Square? Does this help? Can you do the Jazz Square and a shimmy? Both ways?